High solids 100% acrylic traffic paint. Dries in less than 5 minutes. 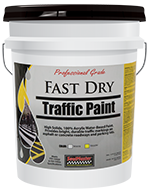 SealMaster® Fast Dry Traffic Paint is a rapid drying acrylic water base paint formulated for striping exterior and interior asphalt and concrete surfaces.